Militia Meeting. 1773. Historical Image Bank. The Committees of Correspondence were provisional Patriot emergency governments established in response to British policy on the eve of the American Revolution throughout the Thirteen Colonies. Additionally, Committees of Correspondence served as a vast network of communication throughout the Thirteen Colonies between Patriot leaders. On the verge of the American Revolution, Committees of Correspondence were formed in cities and regions throughout the American colonies. The most influential Committees of Correspondence on the eve of the American Revolution were located in the colonies of Massachusetts, Rhode Island, New York, Pennsylvania, Delaware, Maryland, Virginia, and North Carolina. These Committees of Correspondence were intercolonial standing provincial governments. The first of these provincial governments was formed in November of 1772 in Boston. Since the end of the French and Indian War, the city of Boston had become the hotbed of radicalism in the American colonies, so it was no wonder the first Committee of Correspondence was formed in Boston. 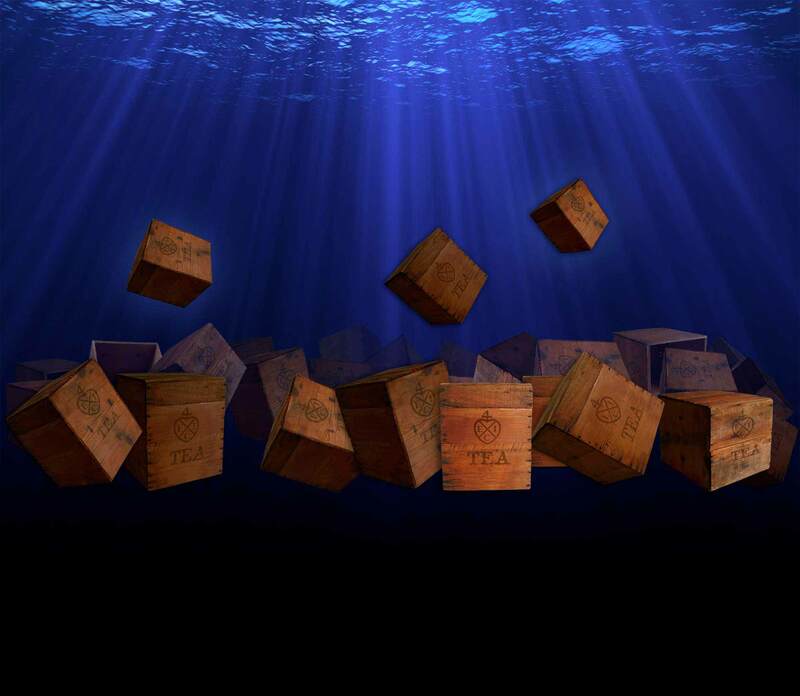 In late 1773, the Boston Committee of Correspondence was charged with managing the “tea crisis” and was the driving force of the December 16, 1773, Boston Tea Party, which was carried out by the Sons of Liberty. The Boston Committee of Correspondence and the Sons of Liberty worked in conjunction with one another; the majority, if not all, of the members of the Boston Committee of Correspondence were also members of the furtive Sons of Liberty. The Committees of Correspondence were established on the notion of diplomacy and served as a springboard for action, whereas the Sons of Liberty were an underground organization which operated in secrecy and used force, intimidation, and took physical action. The Committees of Correspondence rallied colonial opposition against British policy and established a political union among the Thirteen Colonies. 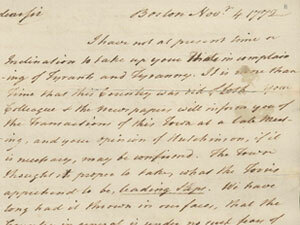 Letter from Samuel Adams to James Warren, 4 November 1772. Massachusetts Historical Society. Since the 17th century, committees were not unknown to colonial legislatures in the American colonies. Colonies used these committees to deal with important issues between the individual colony and Britain. Committees were formed in 1764 in Boston to garner opposition to the Currency Act and other reforms imposed on the customs service, and in 1765 both Boston and New York City formed committees to oppose the Stamp Act. However, unlike the Committees of Correspondence, these early colonial committees were temporary organizations quickly dissolved after the issue at hand was resolved. The structure of pre-Revolutionary colonial society greatly influenced and contributed to the establishment of the Committee of Correspondence. Individual towns, from the earliest days, provided an environment of cooperation and a degree of discipline, which would have not been feasible except in the social, political, spiritual, and dynamic environments under which these communities thrived. The close mutual association of towns and the influence of town meetings, clergy, and later newspapers in colonial America created an atmosphere in which a cooperative spirit was nurtured; thus, when the Committees of Correspondence were created they had a profound effect stirring the populace into collective action. The first standing Committee of Correspondence was formed by Samuel Adams and twenty other Patriot leaders in November of 1772 in Boston in response to the Gaspée Affair, which had occurred the previous June in the colony of Rhode Island. 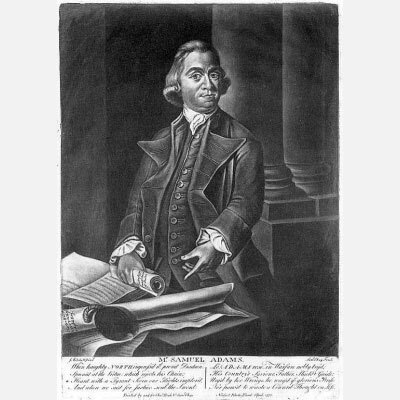 Samuel Adams portrait. Samuel Okey. 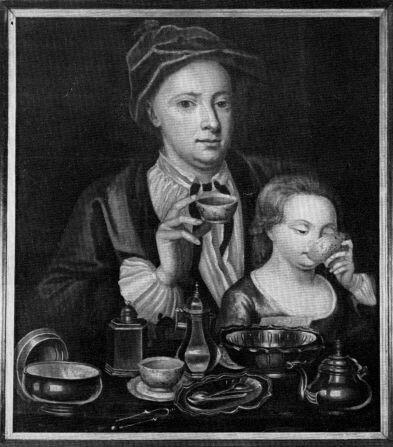 1775. National Portrait Gallery, Smithsonian Institution. 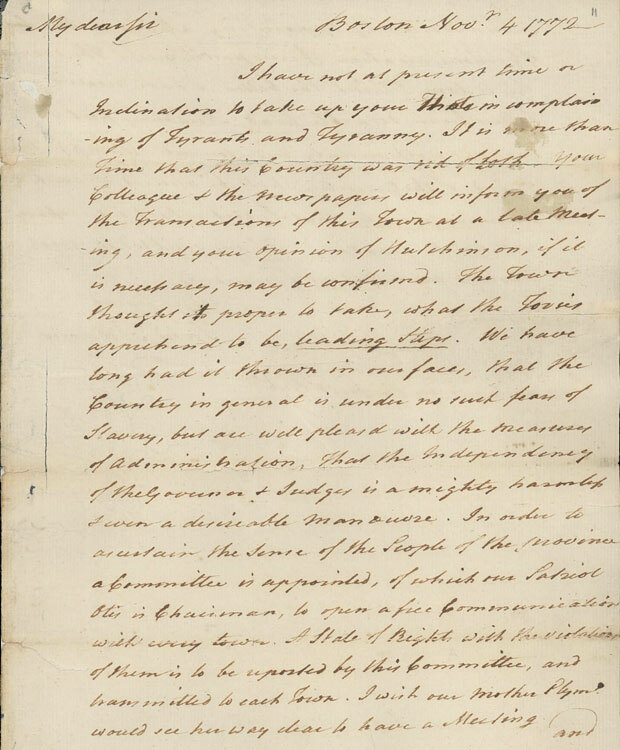 Immediately following the issuing of the list of grievances, the majority of towns in Massachusetts took stock in the example set by the Boston Committee of Correspondence and established a network of Committees of Correspondence throughout the colony of Massachusetts. The name Committee of Correspondence helped garner support during this radical period. Rather than being singular in title, the word “committee” carries no authoritative ring and carried more moral power in the minds of the colonists than a request from a single representative or even a single town would have. Soon after the formation of the Boston Committee of Correspondence and the network of Committees of Correspondence which soon sprung up all over Massachusetts, in the spring of 1773 Committees of Correspondence were established in the colonies of Rhode Island, Conneticut, New Hampshire, and South Carolina. By February 1774, eleven of the Thirteen Colonies, excluding Pennsylvania and North Carolina, had established networks of Committees of Correspondence. In terms of power, by early 1774 the Committees of Correspondence had superseded the colonial legislature and royal officials in the Thirteen Colonies. The Committees of Correspondence were influential in revolutionizing the town meeting from discussions of local matters to far-reaching global politics. In effect, the town meeting became the action-level for the Patriot cause. These meetings served as a means for the concerned citizenry to voice their opinions about the grievances they had with Britain. The primary function of the Committees of Correspondence was the championing and implementation of the Patriot cause through diplomatic means. The vast network of Committees of Correspondence served as a powerful pipeline through which information could be transmitted to all of the Thirteen Colonies. The Committees of Correspondence served as a well-calculated Patriot network for the dissemination of news and information as it related to grievances with Britain from the major cities to the rural communities. The Committees of Correspondence were responsible for ensuring the information they disseminated was accurate and reflected the views of their local parent governments on particular issues, the colonial interpretation of British policy, and that the information they issued was sent to the proper factions. Information was disseminated by the Committees of Correspondence throughout the Thirteen Colonies through pamphlets and letters carried by post riders or onboard ships. Additionally, newspapers served as vital tools and communiqués for the network of Committees of Correspondence. The Boston Committee of Correspondence relied on the Boston Gazette and Massachusetts Spy as a principle means of disseminating information regarding the Patriot cause and grievances with Britain. The Committees of Correspondence promoted manufacturing in the Thirteen Colonies and advised colonists not to buy goods imported from Britain. The goal of the Committees of Correspondence throughout the Thirteen Colonies was to inform voters of the common threat they faced from their mother country – Britain. The majority of the members of the Committees of Correspondence were also members of their local chapters of the secret Patriot organization the Sons of Liberty. 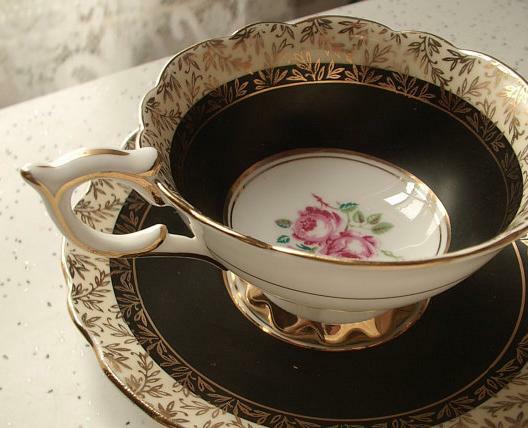 They set up espionage networks to identify disloyal elements and disenfranchised royal officials. The Maryland Committee of Correspondence was influential in establishing the First Continental Congress. They convened in Philadelphia in September and October of 1774 to petition Britain to repeal the Intolerable Acts. Committees of Correspondence worked in conjunction with the Committees of Safety, formally Councils of War – which had been in existence since the 17th century. 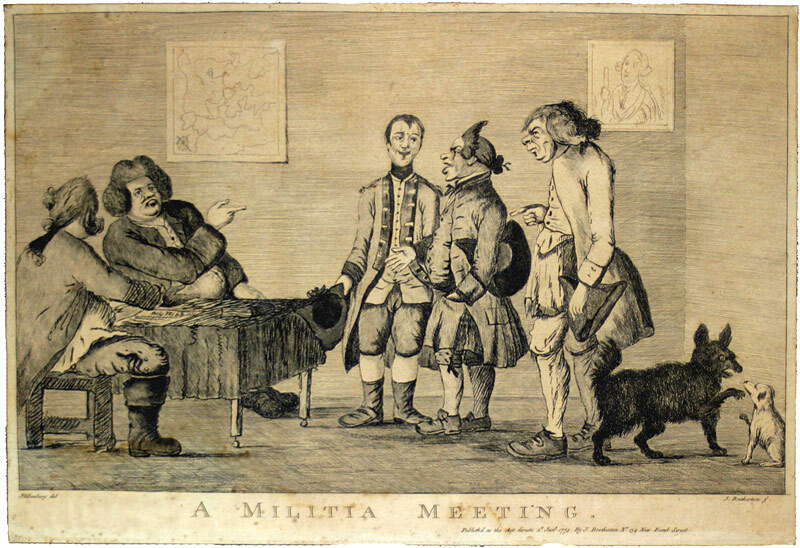 The Committees of Safety, like the Committees of Correspondence, were formed on the eve of the American Revolution throughout the Thirteen Colonies in response to tensions with Britain and empowered committees to “alarm, muster, and cause to be assembled” as much of the provincial militia as needed at any time. The Committees of Correspondence and the Committees of Safety, most notably in Massachusetts, were influential in the organizing, training, and arming of Patriot militias and establishing companies of minute men prior to the outbreak of the American Revolution on April 19, 1775, at Lexington and Concord. Committees of Correspondence provided the political organization necessary to unite the Thirteen Colonies in opposition to Britain. As a political entity, the Committees of Correspondence were replaced during the American Revolution by the more formal and qualified Provincial Congresses but they still continued to function at the local level. The Committees of Correspondence could hardly claim to be the voice of the majority of colonists in the Thirteen Colonies, but their voice was the loudest and most broadcast of all the factions. With what appeared as great support and acceptance throughout the Thirteen Colonies, Committees of Correspondence were seen as a major grievance to supporters of the Loyalist cause. In July 1774 in Worcester, Massachusetts – a hotbed of Patriot support- a letter signed by fifty-two “free men” stated the following denouncing the Committees of Correspondence as rebellious: “The committees of correspondence in the several towns of this province, being creatures of modern invention, and constituted as they be, are a public grievance; having no legal foundation; contrived by a junto, to serve particular designs and purposes of their own; and that they, as they have been, and now are managed in this town, are a nuisance.” The Committees of Correspondence could hardly claim to be the voice of the majority of colonists in the Thirteen Colonies, but their voice was the loudest and most broadcasted of all the factions. It was very easy to establish and form a local Committee of Correspondence. Any localized group of Patriots could form a committee and join the vast network of Committees of Correspondence and serve as the Patriot voice for their respective region. Roughly, 7,000 to 8,000 Patriots served as delegates at the local and colony level on the various Committees of Correspondence. Nonetheless, the influence and implications of the Committees of Correspondence were enormous and directly led to the outbreak of the American Revolution. 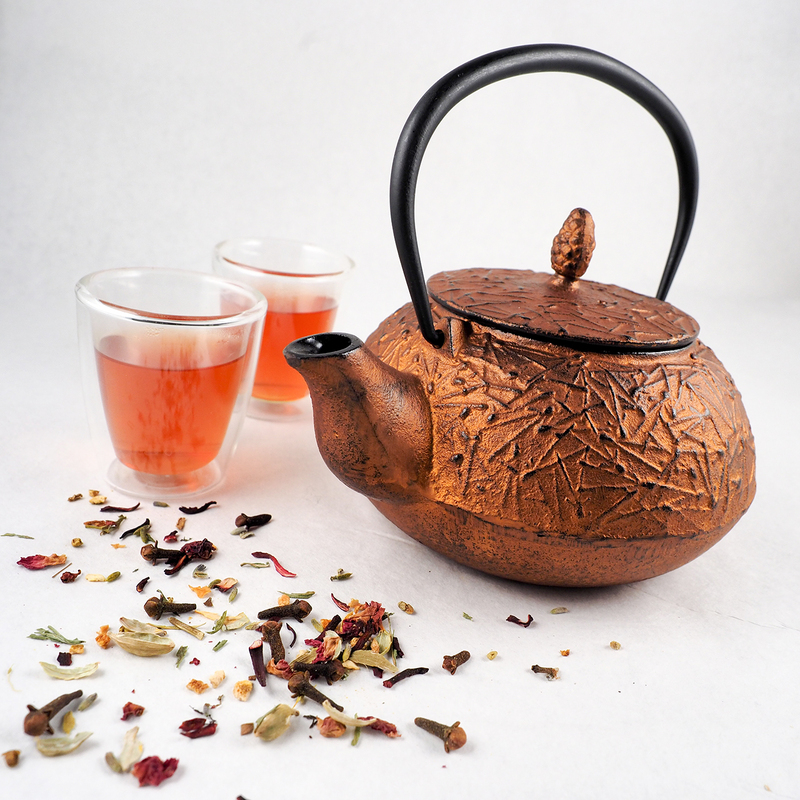 With arrival of the Dartmouth, Eleanor, and Beaver carrying cargoes of British East India Company Tea, the Boston Committee of Correspondence was charged with managing the “tea crisis” in late 1773. 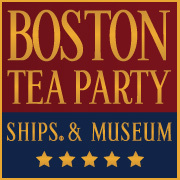 The Boston Committee of Correspondence was the driving force of the December 16, 1773, Boston Tea Party, which was carried out by the Sons of Liberty. Samuel Adams was the prominent leader of both organizations. The meetings in November and December at the Old South Meeting House held prior to the Boston Tea Party were organized by the Boston Committee of Correspondence and the Sons of Liberty. 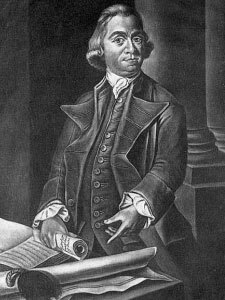 Samuel Adams called upon the Committees of Correspondence from throughout Massachusetts for support, calling them to be in “readiness in the most resolute manner to assist this Town in their efforts for saving this oppressed country”.